Preheat the oven to 200°C / gas 6. Melt the ½ of the butter and use it to brush the inside of 6 ramekin dishes. Sprinkle the walnuts into the dishes and tap around the edge so they stick to the butter. Arrange on a baking sheet and set aside. Cut the asparagus into 1cm pieces, leaving the tips a little longer. Cook with the peas in plenty of boiling salted water until tender. Drain and, reserving the asparagus tips, puree the stems and peas to a coarse paste using a hand blender or food processor. Set aside. Melt the rest of the butter in a heavy bottomed saucepan. Add the flour to make a roux and cook for a minute before whisking in the milk. Cook the sauce for a few minutes until thickened and remove from the heat. 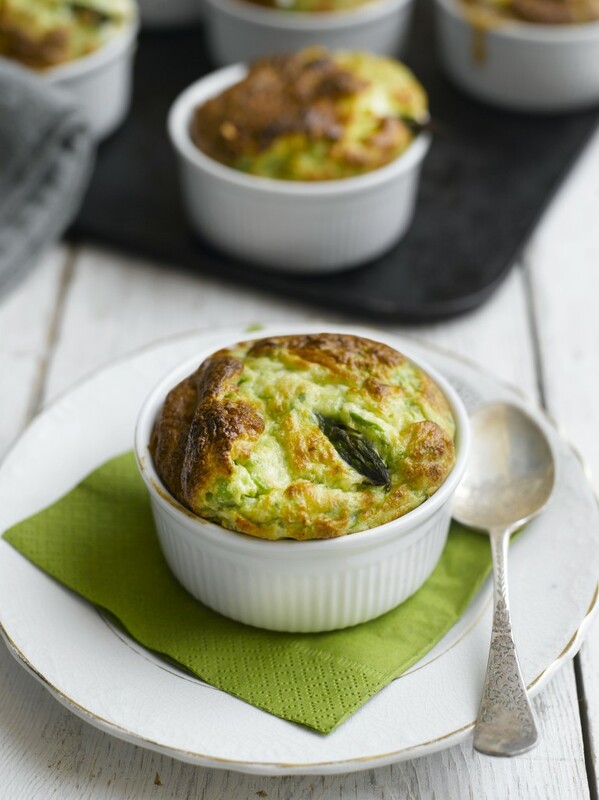 Chop the goats’ cheese into cubes and stir through the sauce along with the pureed asparagus and peas. Season generously. Separate the eggs carefully, tipping the yolks into the asparagus sauce and the whites into a really clean metal bowl. Stir the yolks through the sauce to mix well. Whisk the egg whites until stiff and fluffy. Don’t over whisk as they will be too dry to fold through the asparagus sauce. Take a large spoon of the egg white and stir it vigorously in the sauce, then pour the sauce into the bowl of eggs whites. Using a large metal spoon fold the sauce very, very gently through the egg whites. Spoon the mixture very gently into the prepared ramekins, push the reserved tips gently into the top of the mixture and bake in the oven for 20 minutes. Try to resist opening the oven door whilst they are cooking as they will collapse. Serve immediately with a simple green salad.